Some people don't realize that you can have a green wedding that doesn't take place in a garden or forest. Glam girls & guys can be green too! Think Cary Grant, Marilyn Monroe, James Dean or Audrey Hepburn for style inspiration. A va-va-vintage theme is the best way to make a Halloween wedding a fun costume event while avoiding looking like a children’s party. Research, recycle and reuse comes heavily into play when planning a va-va-vintage Halloween wedding. 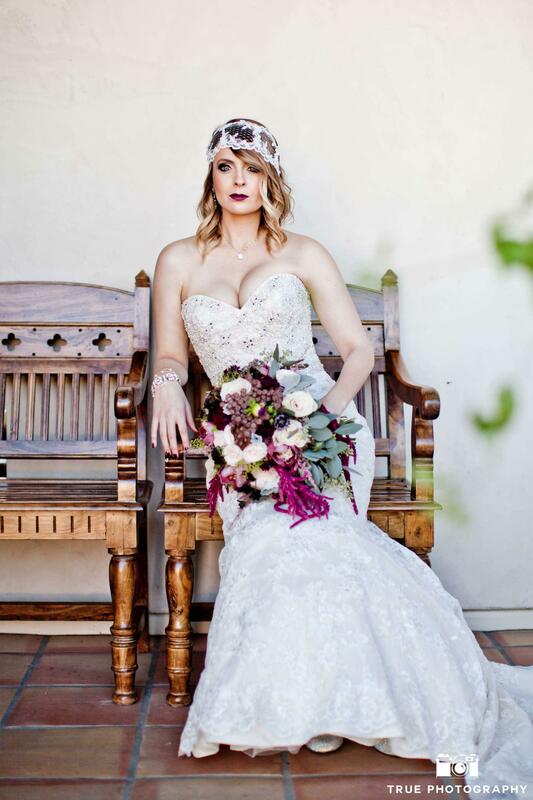 Pick a time in the past (The 1920's flapper, the 1940's Hollywood glam, 1950's rockabilly are popular choices) layer in vintage accents and voila, a brilliantly green wedding fit for a queen or king! Hello my perky planners and bridal babes, let’s talk Halloween weddings. Now I know most of you aren’t interested in skulls, black cats, and witch hats as your wedding motifs but you can still incorporate the spirit of Halloween into your wedding by focusing on the dress-up aspect of October 31st. A va-va-vintage theme is the best way make a Halloween wedding a fun costume event while avoiding looking like a children’s party. Some people don't realize that you can have a green wedding that doesn't take place in a garden or forest. Glam girls & guys can be green too! Think Cary Grant, Marilyn Monroe, James Dean or Audrey Hepburn for style inspiration. Research, recycle and reuse comes heavily into play when planning a “Va-va-vintage Halloween” wedding. 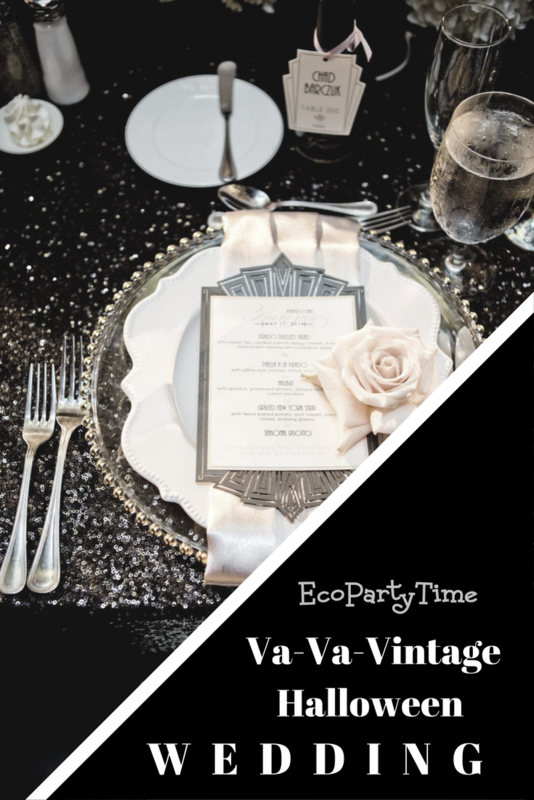 Pick a time in the past (The 1920's flapper, the 1940's Hollywood glam, 1950's rockabilly are popular choices), layer in vintage accents and voila, a brilliantly green wedding fit for a queen or king. When you are planning a vintage wedding, do the research on the prevailing motifs and themes of the decade you are considering. For example, the “Roaring Twenties” were all about breaking new ground in technology and music & living life to the fullest. There are dance & recreation societies who will love to come and teach your guests the dances & lingo of the day. 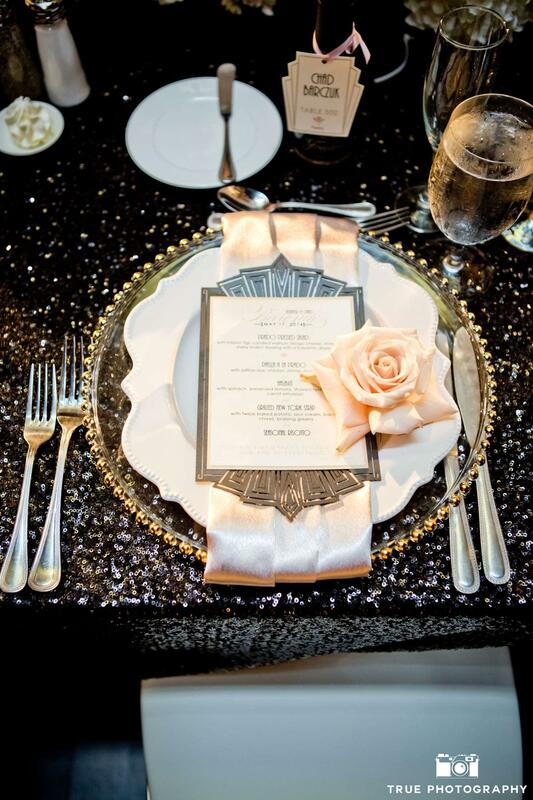 Most will even hang around to give your reception vintage flavor. 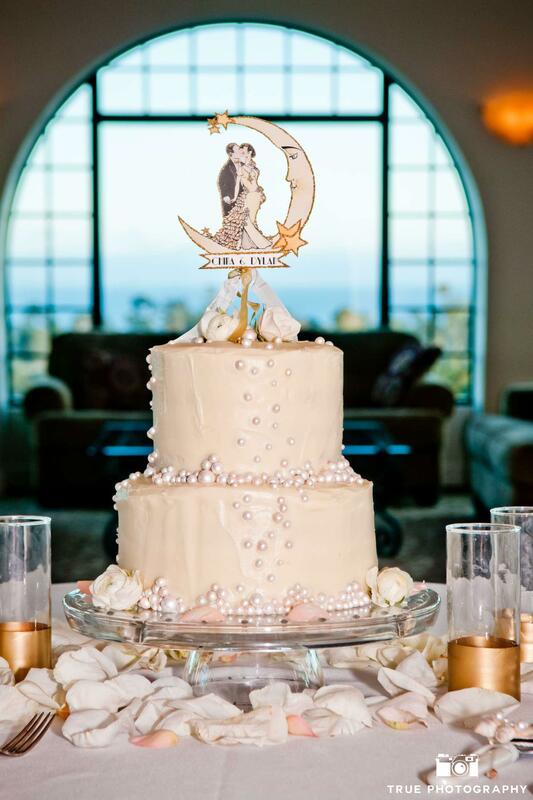 Long strands of pearls, moons & stars, jazz & Art Deco architecture are all motifs you can use to make a dazzling twenties wedding and reception area. 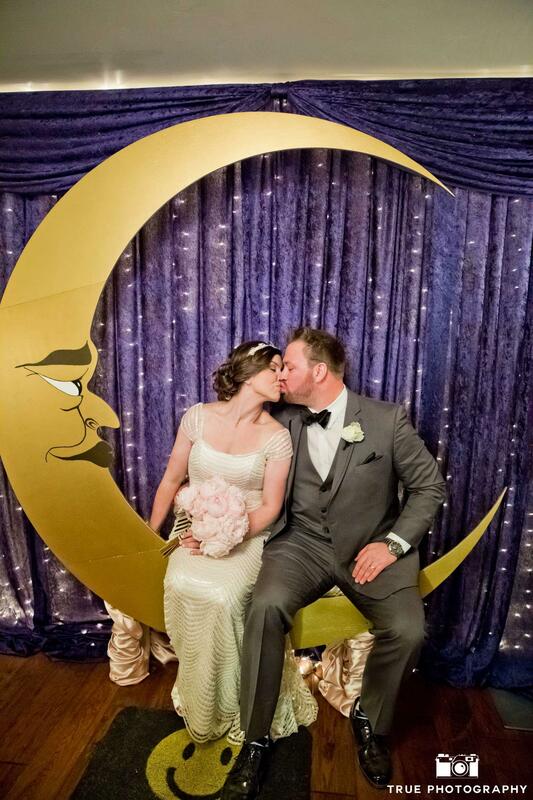 For a 1920’s “man in the moon” wedding, for example, you can make your “man in the moon” the central theme of your photo booth, invitations, and even your cake topper. 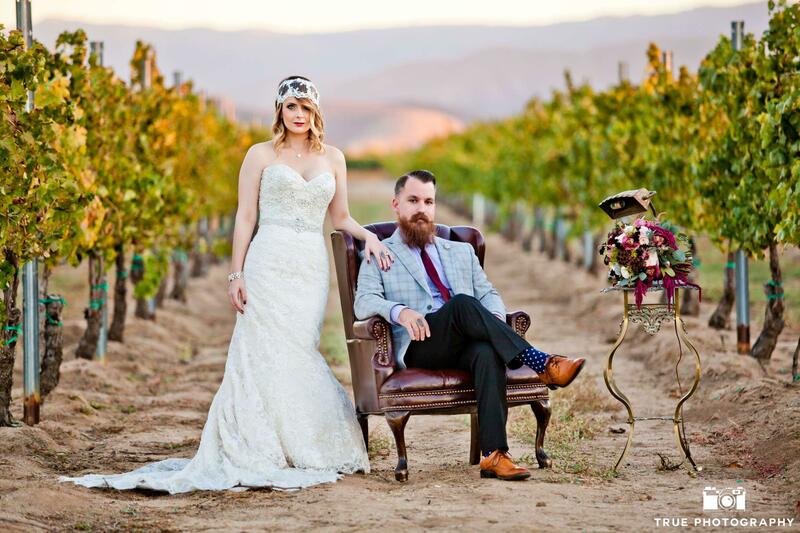 To make your Va-va-vintage Halloween wedding truly authentic, search vintage shops & your relative's closets and trunks for clothing, music, photos, accents, even jewelry and bags from back in the day. 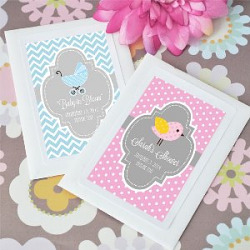 Encourage guests to come dressed in character by suggesting it on your invitations. You will be surprised at how many people will get excited at the prospect of going back in time, especially around Halloween. You can even get your vendors in on the fun. Most will jump at the idea of dressing in something besides basic black and even suggest other vintage ideas like menus from the period or favor ideas that will highlight your chosen decade. At our 1920’s wedding, our DJ brought an authentic 1929 microphone & our videographer dressed like a gangster since, in his words, he’d be “shooting people all night long” LOL The guests loved it! 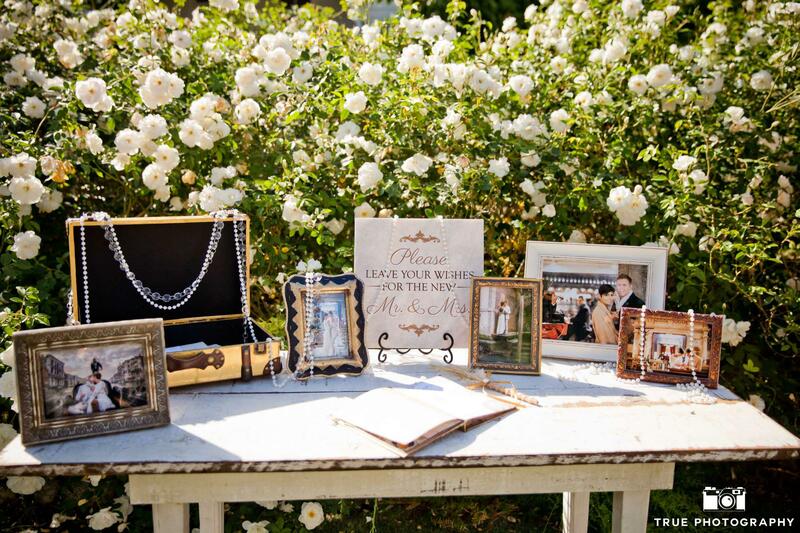 As with the rest of a great va-va-vintage wedding, your venue can enhance your theme. Search out historical venues which fit the theme, either by being built in the decade you are highlighting or look like they were. For example, a 1920’s wedding held in an Art Deco Building suggests flappers and jazz just by the architecture. And as a sustainable plus, usually the money usually goes to preserve the historic buildings. As always, we love seeing your green wedding ideas in action! 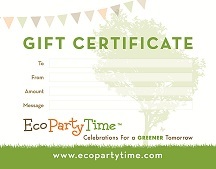 Please post pictures of your sustainable wedding with the hashtag #Ecopartytime so we can share in your wonderful and earth-friendly wedding! We’d love to see your “Va-va-vintage Halloween” wedding ideas. Melissa Wagner-Gens is Chief Chica Verde at Emerald Events & Weddings & your green event expert here at Ecopartytime. “Saving the world, one wedding at a time”™!